Most women have a favorite engagement ring style no matter what stage their relationship is in. If you and your significant other are ready to take the next step and you think he may pop the question soon, you don’t need to keep your ring choices to yourself. Don’t keep him guessing when it might be worth dropping a few well-placed hints. How can you subtly reveal a few clues without ruining the surprise of a proposal? Follow these tips and choose the ideas that work based on how much or how little input you want to share. Give him visuals – You can be as sneaky or straightforward as you prefer. You may consider sharing your Pinterest board or accidentally leave a website open on his laptop. But if you are both straight-shooters, you might want to just be upfront about your style preferences and have that conversation. Have someone tag along – Your partner should have one of your loved ones join him in the search. It will be easier to get your dream ring if your sister, best friend or parent comes along. This person knows your taste well and you can even give them tips ahead of time. Let him know shape and color – Since this is one of the most important parts of your ring, be sure to make your wishes known by gushing over certain cuts or being upfront with your favorite. Also, make it very clear if you prefer a colored gemstone since there are plenty of options. If you swoon over sapphires or get excited for emeralds, discuss the possibility of a unique ring. Let him know your ring size – He can’t really measure your finger while you sleep so mention it in a conversation when you can. For example, say you need to go get a ring resized and be sure to mention what the new size will be. His ears will perk up if he is trying to figure out a way to get this information. Mention the metal – Do you want yellow or white gold, platinum, mixed metals or rose gold? Start wearing nothing but that jewelry so when your beau looks at you he will get a good idea of your style. Set him up for success by wearing only white gold if that is your ring choice. Design it together – A new trend is making a custom ring together. You can research stones and settings, then find a jeweler in your price range to make your design a reality. It will be a meaningful project you can both look back on and cherish. 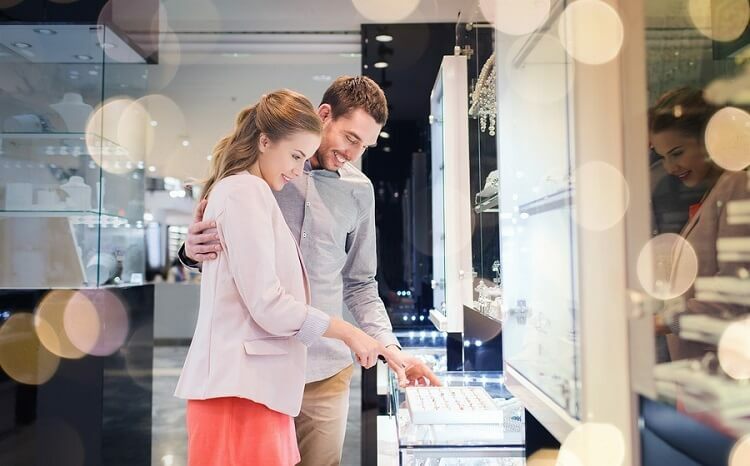 Shop together – It might make traditionalists gasp, but there is no better way to find the perfect ring than going in as a team. Let your partner make the final purchase to keep a little of the surprise intact. Drop hints and then have faith – Make your favorite elements known and let your partner surprise you with what he picks. It may only take a few parameters to get him going in the right direction. If you are too “type A” this could be difficult, but a good surprise during your proposal can be worth it. Whether you practically pick out your own dream engagement ring or leave the bulk of it up to your soon-to-be fiancé, part of the fun is in the unknown. Once he pops the question and you are on your way to happily ever after, be sure to visit Lavalier and get your most precious possession insured and protected. Contact us for a personalized jewelry insurance quote. How to Drop a Hint about the Engagement Ring You Really Want. www.lover.ly. (accessed Feb 19 2019). 5 Ways to End up with the Engagement Ring You Love. www.theknot.com. (accessed Feb 19 2019). Lavalier is pleased to share this material with its customers. Please note, however, that nothing in this blog should be construed as legal advice or the provision of professional consulting services. This material is for general informational purposes only, and while reasonable care has been utilized in compiling this information, no warranty or representation is made as to accuracy or completeness. Takes under a minute. No contact information required. All policies are issued by Berkley National Insurance Company and administered by Lavalier.